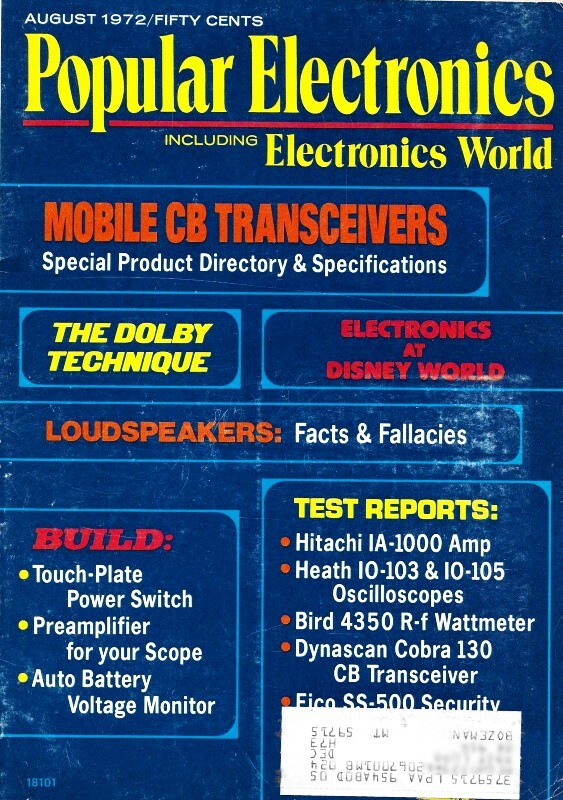 A lot of us still use older test equipment at home and even in the company lab. 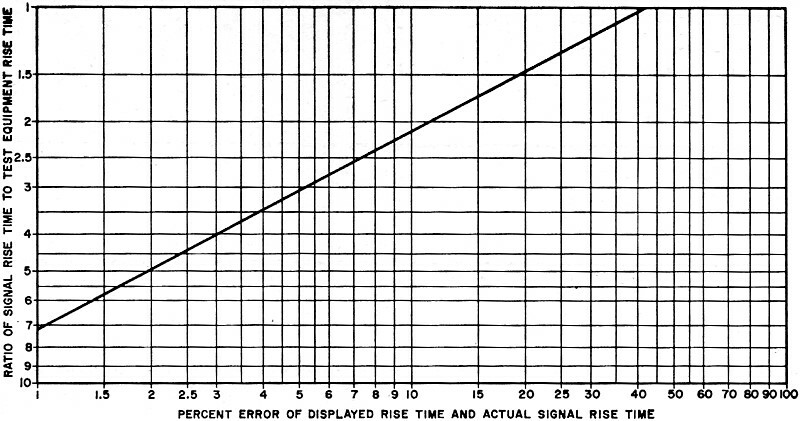 As discussed in this 1972 article from Popular Electronics magazine, the displayed rise time on an oscilloscope display is not necessarily that true rise time of a signal - particularly when the speed approaches the rated bandwidth of the equipment. In that case, it is necessary to mathematically compensate for the rise times of each individual component used for making the measurement. Hooking the o-scope probe tip to the calibration point on the front of the instrument and adjusting the probe's trim capacitor for a flat response is not always good enough. Most modern o-scopes can calculate and apply corrections automatically, negating the need for a manual correction. If your application is not super critical from a timing standpoint, then you do not need to bother with correction, but it is worth keeping rise time measurement inaccuracies in mind just in case you run into an otherwise inexplicable problem that may turn out to be a timing issue. Suppose you feed the output of a pulse generator through a probe to an oscilloscope. You adjust the scope time base for a fast sweep. (This is the typical setup for measurement of rise time.) The result is the easily recognized rise-time waveform shown in Fig. 1. Fig. 1 - Pulse rise time is measured between the 10% and 90% points on the leading edge of oscilloscope trace. In this case, rise time is 100 nanoseconds. Question. If the time base is set for a sweep of 50 nanoseconds per division, what is the rise time of the generator's output pulse - ignoring any inherent scope inaccuracies. "That's easy," you say, quickly multiplying 50 ns/div times the two divisions covered by the pulse's leading edge. "100 ns is the rise time of the pulse. Right?" Maybe yes; and maybe no! Although 100 ns is the correct reading of the scope display, this value may not be the true rise time of the pulse. So ignoring scope inaccuracies, what other reason is there for suspecting that the measurement is not the real rise time? Basically it is that, when the pulse passes through the probe, the scope amplifier, and even the scope CRT, it suffers rise time deterioration. Thus, the displayed waveform can't represent the true, original signal. Although this is an unfortunate circumstance, it has one saving grace: it can be predicted. So, if you erroneously said that the rise time in the example was 100 ns, it should be both interesting and informative to learn how to determine what the error might be. For a low- to medium-priced general-purpose oscilloscope, a typical rise time is 35 ns. Thus, the actual rise time of the generator pulse is 93.1 ns and not the 100 ns displayed on the scope; and the measurement was in error by 7.4%. It is important, therefore, to keep in mind that the displayed rise time is greater than the actual rise time. The amount of error is shown in Fig. 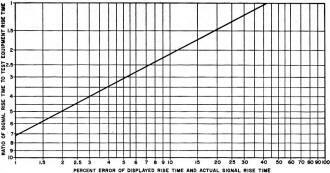 2, where per cent of error is plotted against the ratio of the input signal's rise time to test equipment rise time. In our example, this rise time ratio would be 93.1 divided by the square root of 352 + 102 or 2.56. Knowing that the measurement devices do introduce an error and with the aid of Fig. 2, you can determine just what error to expect. Conversely, to make a measurement within a given accuracy, Fig. 2 can be used to find what rise time response is needed in the test equipment. Fig. 2 - Measurement error is inversely proportional to the rise-time ratio. More About Rise Time. We often concern ourselves with only the frequency response of an oscilloscope or an amplifier when, as we have seen, rise time is also important. In using Fig. 1, we measured rise time between the 10% and 90% points of peak value on the leading edge of the pulse. These two points are used as standards for waveform measurement in the industry. Oscilloscope vertical amplifiers consist of cascaded RC stages so the above formula applies. For instance, if a scope has a 10-MHz bandwidth, its corresponding rise time would be 0.035 microseconds or 35 ns. 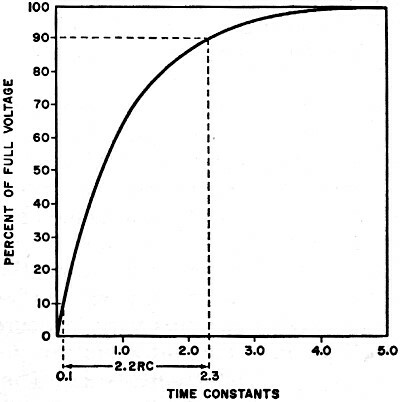 -3 dB frequency = FC = 1/ (2πRC) Consider first the 2.2RC factor and look at the universal time constant curve in Fig. 3. 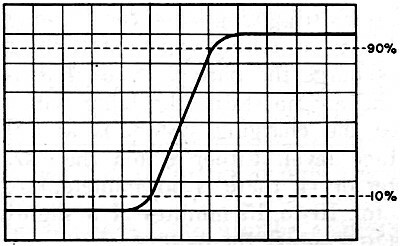 This curve will readily be recognized as the capacitor charging voltage in a series RC network with an applied ideal step pulse. Recalling that, in rise time measurements, the 10% and 90% points were used, we find the corresponding RC value for these two points: namely 0.1 RC and 2.3 RC. Taking the difference between these two values, we get 2.2RC - the time in which rise time is resolved. Fig. 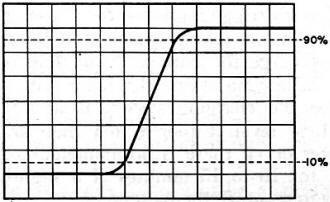 3 - This is time constant curve for charging capacitor in series RC circuit. But wait just a moment! The curve in Fig. 3 is not Gaussian, so how can it be used in our calculations? Well, irrespective of Gaussian - or whatever - the universal time constant curve serves only as a reference for the 2.2 RC value. It is not the signal pulse to be measured (as in Fig. 1) and thus does not have to be Gaussian. Remember that what we did say about Gaussian response was that it pertained to an amplifier stage whose frequency response is RC limited. This brings us to the second factor in the 0.35 constant: the -3-dB frequency, or the frequency at which an amplifier's gain is down 3 dB from mid-frequency gain. The influence of the stage's resistance and capacitance is shown in the -3-dB frequency formula: FC = 1/ (2πRC). Having defined these two factors, let's see how they determine the 0.35 constant. First, transpose FC = 1/(2πRC) into RC = 1/(2πFC). Then from tr = 2.2RC, we get tr = 2.2. [1/(2πFC)] = 0.35/FC. Finally, 0.35 = tr X FC. Or since frequency response is bandwidth, 0.35 = v X bw.